You are disoriented and lost, seemingly abandoned in a distant land. 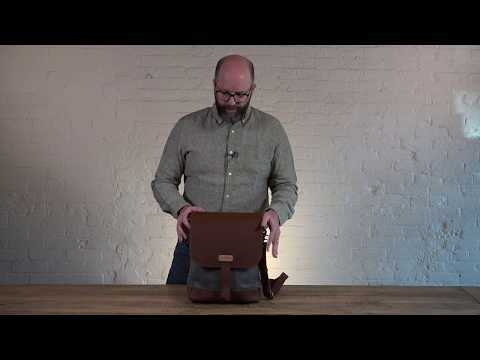 Shaking away the confusion, you reach down to discover your trusty Pad & Quill Field Bag. Instantly, you know everything is going to be all right. Okay, this probably won't happen to you, but even around town it never hurts to have your favorite tools at your side. Crafted with the durability to become a family heirloom, the substantial full grain American bridle leather and hefty twill woven 18 oz. waxed canvas will beautifully age, leaving an indelible record of your daily travels – even if they are just to work and back. The Field Bag features an ultra-slim vertical design that has tons of pockets to keep all your gear organized. We’ve managed to include a padded pocket perfectly suited for the iPad Pro or a 15” laptop, a strap-secured pocket for your charger cords, a business card sleeve, two pen / Apple Pencil holders, a front iPhone pocket, and two quick access document pockets complete the package.Crafted to be durable and take a beating with custom thick American full-grain bridle leathers, 18 oz rugged twill waxed canvas, and nylon UV-resistant stitching that is used to construct parachutes. Yep…parachutes. Every single Field Bag has a Cherry wood panel with our emblem laser etched into it, and inside you’ll find a signature discreetly placed. That is the autograph of the craftsman or woman that made your bag. That’s why we say “Crafted with pride” at Pad & Quill.